Locals and the Music Festival!! Coachella Music Festival grounds are larger and even grander! Locals and the Music Festival!! As with all relationships,there is a yin and a yang to the three weekends of the Coachella Music Festivals. The first two bring in current superstars, future hopefuls, and recent New Musical discoveries in the Coachella Music Festival. The only difference this season was the SIZE of the Festival..the city approved a newly enhanced limit of 125,000 people. The grounds themselves were larger too. All this was FANTASTIC! But…increased traffic, increased litter, long waits, detours to stay away from the busy streets..some inconveniences for us locals. Music Vibes reach Thermal, CA. Wide Open Spaces in the desert city of Thermal, CA. Music Vibes reach Thermal, CA., in the form of Deg Fest! There are so many changes happening in our eastern Coachella Valley, and now it’s Thermal, CA. music! Development is pushing further and further East..toward the gorgeous purple shadows of the Chocolate Mountains. Pretty much everyone now knows about the Coachella Music Festival in Indio, Calif., and coming for the first time in October, is Desert Trip. Two weekends of extreme “older” music favorites sold out in a matter of hours. Well, now the local music vibes are moving into the desert city of Thermal, CA., with it’s Deg Fest. June 24 and June 25, will see this mystical music venue taking place at Rancho La Mora, in Thermal, CA. Call Kim Kelly for a tour of properties today at 760-285-3578. The Coachella Music Festival has added Desert Trip for Fall 2016. The newest Music Festival to be added to the Coachella Music Festival line up is Desert Trip. So what’s the big deal?? Another Music Festival in Coachella..what’s the big deal? Well it DOES matter, and it IS a big deal! This will be the first time a Fall Music Festival will be held at the Polo grounds in Indio, CA. Two weekends of staggering shows have come together, and tickets were snapped up immediately! A fall Music Festival, that is very different from the Coachella style, will be another boost for the entire Valley, states Kimberley Kelly, local Realtor. Coachella Music Festival Lease Properties: One of the positives of having the HUGE success of the Coachella Music Festivals, is the increased demand for Leases. Not all Music Festival requested Lease properties are “Luxury”. Meaning simply that not everyone has rich tastes. There are many, many demands for people visiting that are quite happy with a small condo at Indian Palms Country Club, and many people actually prefer a regular place at PGA West. So..”Luxury” can mean a different type of Music Festival experience to each visitor to our beautiful Coachella Valley. If you’re thinking of purchasing an investment property, let me set up a tour for you! 760-285-3578. Music Festivals bring Millions to city of Indio, Calif.
Music Festivals bring fans & $ to Indio, CA. Music Festivals bring millions to the City of Indio, Calif. The city of Indio has always been known to the Locals as “The City of Festivals.” Before the Coachella Music Festivals, that generally meant The Indio Date Festival and the Tamale Festival! Not any more. The sleepy city of old Indio has now gained acknowledgement as the home of the highest ranked Music Festival in the world! Tickets for the 2016 Coachella Music and Arts Festival sold out in less than an hour. These two festivals, ranked #1, and #3 respectively, brought in more than $106 million for their organizers in 2015. Forbes ranked them first and third on the list of highest grossing music festivals of the year. (Desert Sun) If you’re thinking of buying or selling in the desert, give me a call at 760-285-3578. Spectacular Event Venue Just Listed in La Quinta, California! Tally Ranch, a private party Venue in La Quinta, CA. Spectacular Event Venue Just Listed in La Quinta, California. This amazing 4 acre property in La Quinta is such a rare find. Exquisitely maintained, hand crafted on so many levels, and offering it’s new owner a myriad of use options. 55075 Monroe St., La Quinta, is better known as TALLY RANCH. Located right off of Monroe St., approx. 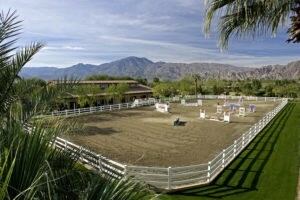 2 miles from the Coachella Music Festival grounds at the Indio Polo Fields, the property is gated and private. Upon entering the custom designed Iron gates, you will believe you are on the grounds of an Italian country Farm. This magical Estate is offered at only $3,999,000, and may be toured only by calling me at 760-285-3578. The Thermal Club; Car Lovers desert Paradise! Beautiful, rural, open land in Thermal, CA, is what brought The Thermal Club. The Thermal Club; Car Lovers desert Paradise! Who would have believed Car owners, collectors and competitors would bring their rarified world to the eastern Coachella Valley. Not me..I’ve lived here for over 30 years, and just did not see this one coming! It really does make sense though. Our Eastern Coachella cities, Thermal, Coachella and Indio have definitely seen an increase in seasonal activities over the past 10 years or so. Every season brings more awareness that there is a bevy of things to do in Thermal, besides watching dates being harvested, and crops being grown. Our East Valley is an agricultural mecca to be sure. With fertile soil, temperate weather, and extreme heat during the summers, many crops thrive! And now comes a car lovers’ dream; The Thermal Club, to further enhance the city of Thermals spot as a destination event city, and have I got a Car Collectors’ Dream Property for you to view. Take the virtual tour below, then give me a call for your own private tour at 760-285-3578. Polo is officially here! The Empire Polo Club already had it’s opening day, and the Opening day for Eldorado Polo Club is this coming Sunday, January 17. The 12 pm match features the Jason Memorial 7 Goal Tournament games, and the 2 pm game will be a 12-goal battle for the Eldorado Challenge Championship. Half time divot stomp is sponsored by CLASE AZUL & CHOPIN VODKA. What a fun event to share with your family and friends. While you’re in town, check out some great new listings at PGA West in La Quinta, California. Turnkey Condos priced from approx. $250,000 – $500,000. PGA condos are fabulous Luxury leases too! Coachella Music Festival Line up is HERE!! 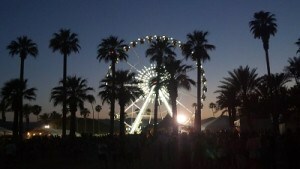 Ferris Wheel at the Coachella Music Festival! The Coachella Music Festival is officially ready to rock! This Internationally renowned Festival always gathers an eclectic collection of upcoming and established stars, then brings them to the beautiful Coachella Valley. The Music Festival Line up for 2016 is HERE! The Music Festival has become an integral part of our Valley, pretty much putting the city of Indio on the radar. 13 years ago, being a local, I would never have believed that people would not only know where Indio, California is, but would purchase property in the surrounding areas FOR their music festival visits! The Music Festival has also created a huge demand for Luxury Lease properties, further driving up the demand for Coachella Valley properties in Indio, and the Coachella Valley in general.